My late grandmother spent a good portion of her lifetime living in the Bahamas. Three of her kids were born and raised there. During her time there, she had her own little market and would sell various things out of her home. One of her classic items was her homemade fried chicken. She lived close to a school and when school would let out, hungry kids would run to her home to buy some of her famous fried chicken. Everyone in the neighborhood loved her fried chicken. Her secret ingredient? French dressing. 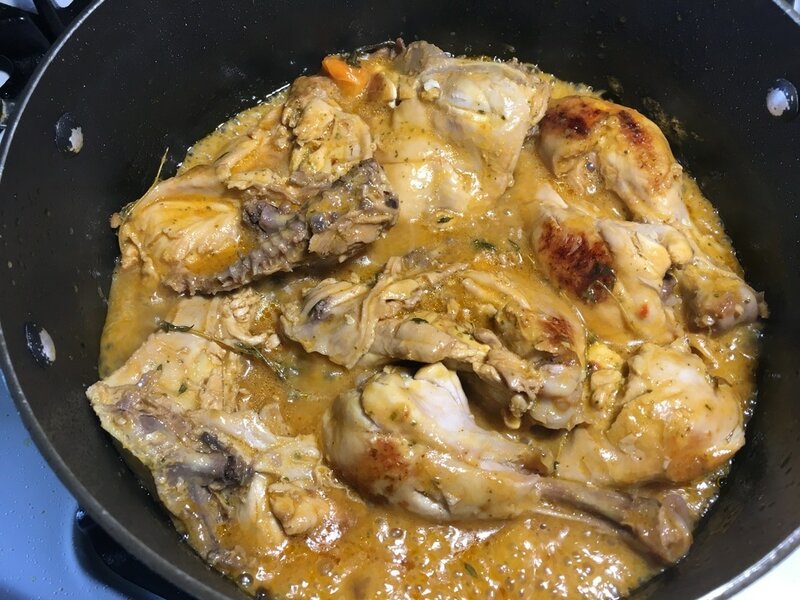 It added a zing as well as a hint of sweetness while still maintaining the traditional Haitian style of frying; browned to a crisp on the outside yet still tender on the inside. This is a take on her version so I hope you give this one a try and let me know what you think. 1. 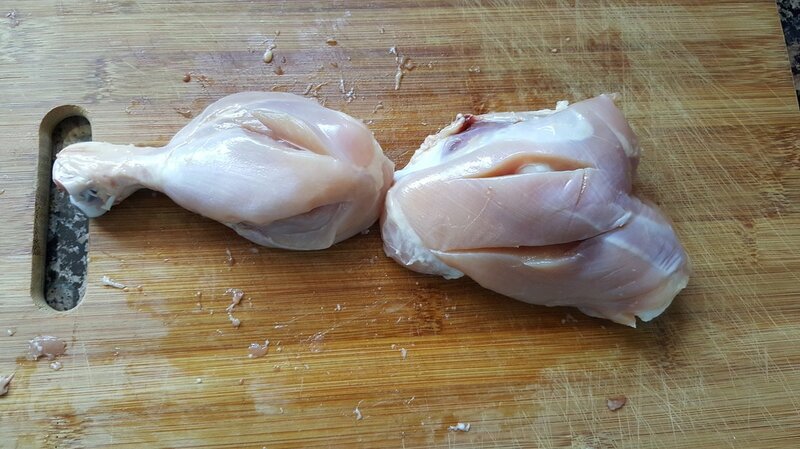 Refer to the “Cleaning Chicken” page and clean the chicken quarters thoroughly. 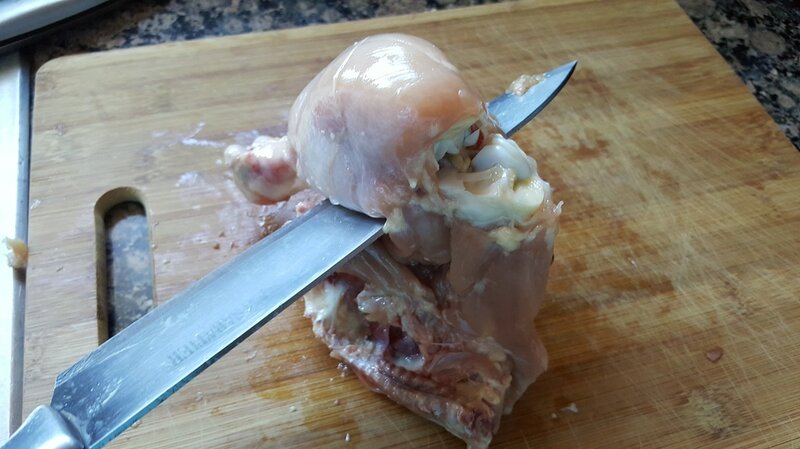 Cut each leg quarter (4 pieces) into separate thigh and leg pieces across the joint (now 8 pieces of chicken total). Cut a couple slits through each piece so that the seasoning can marinate through. 2. 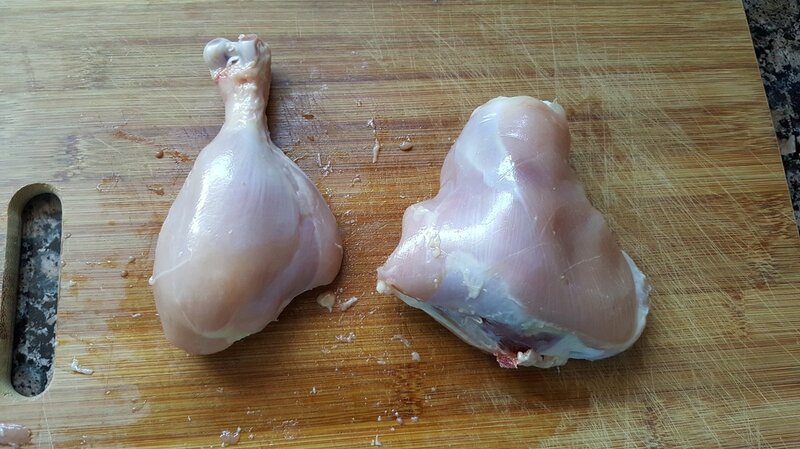 Place the chicken thighs and leg pieces into a bowl. To the bowl add the following spices: 3 tbsps. lime juice, 1 Maggie (crushed or dissolved in the lime juice), 2 crushed garlic cloves, 3 – 5 cloves, 2 – 3 sprigs of thyme, 1 tsp. garlic powder, ½ tsp. seasoned salt, 1/8 tsp. accent (optional), 4 - 5 tbsps. of French dressing, 1 - 2 tbsps. of epis, and ½ tsp. of salt. 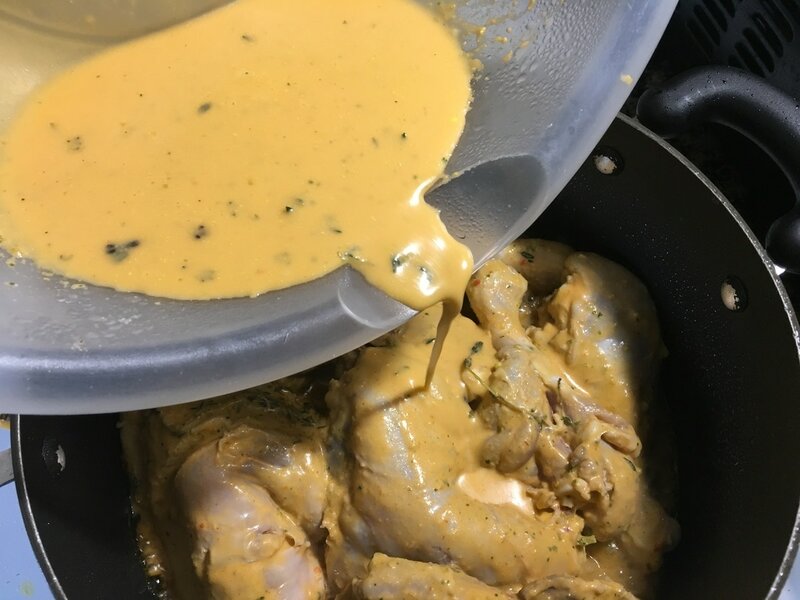 Mix contents thoroughly in order to fully incorporate marinade into the chicken. Marinate at least 30 minutes or overnight. The longer it marinates, the better the flavor. 3. 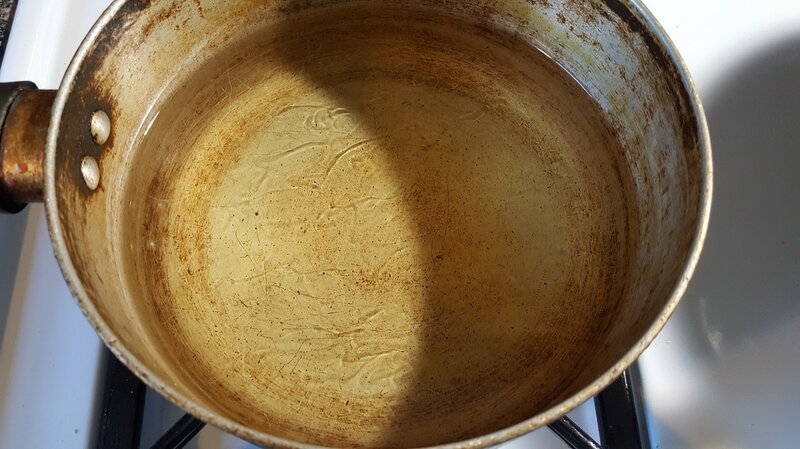 In a large pot on high heat, add 1/4 cup of vegetable oil and 1/4 tsp. of sugar. Allow the heat to reach temperature and for the sugar to brown. The darkened sugar helps to give the chicken color, a trick passed down from my late grandmother. 4. 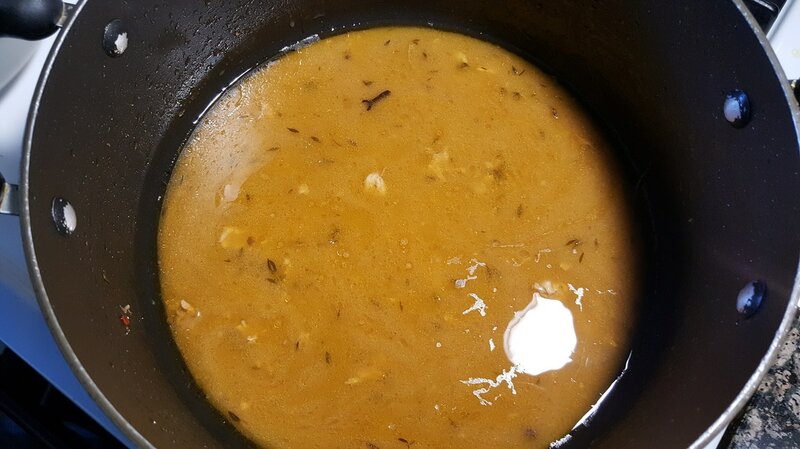 Once the sugar has darkened in the hot oil, individually add the marinated chicken. Be very careful as the oil will splatter. 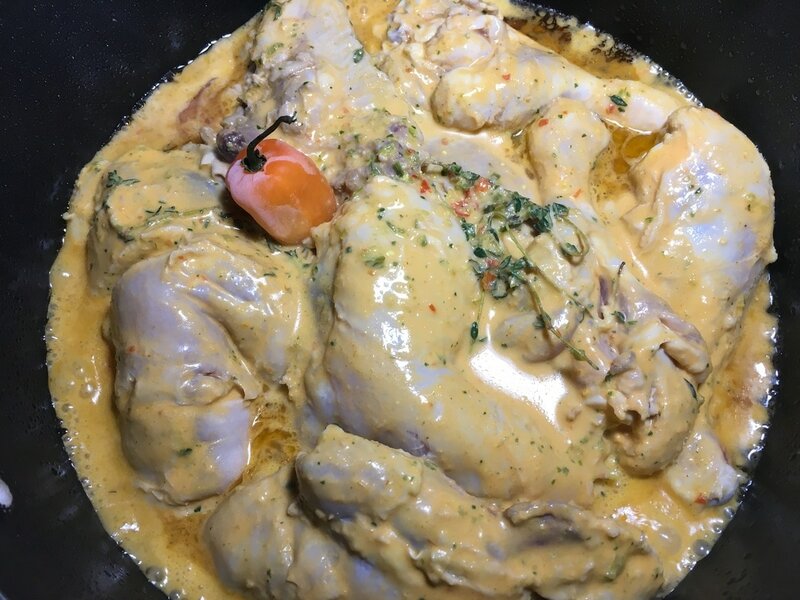 Place the chicken in a way that they all touch the bottom of the pan. Avoid overlapping. ​5. Add about ½ cup of water to the bowl that had the marinated chicken. Mix it around to gather up as much of the marinade that was left behind. Pour the liquid into the pot with the chicken. (Add in the scotch bonnett or habenero pepper in the liquid if desired.) 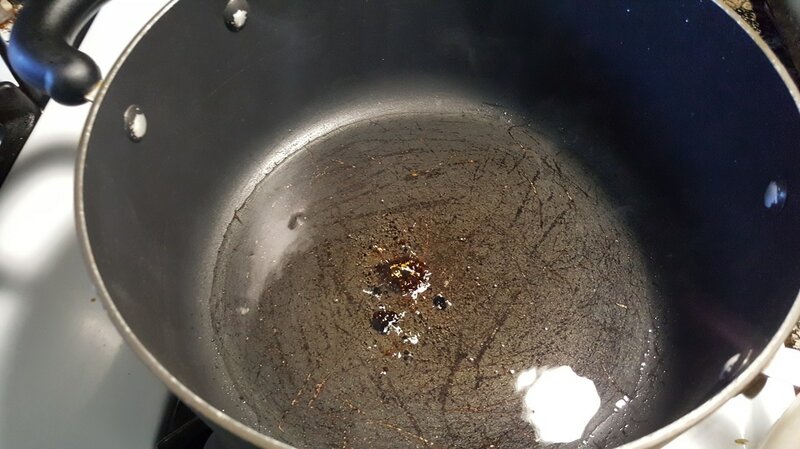 Once the liquid has come up to a boil, reduce the heat to medium and cover the lid. Let it cook for 15 - 20 minutes. 6. Using tongs, flip the chicken so that the other side can continue to cook. Replace the lid and cook for about another 10 – 15 minutes. If you need to add in extra water, do so accordingly. ​8. 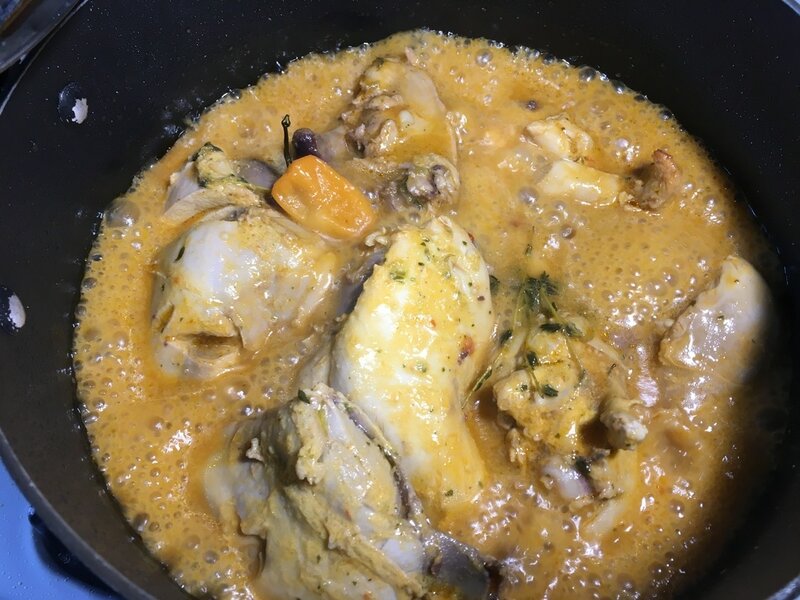 Prepare a pot or pan with enough oil to fully submerge the chicken. 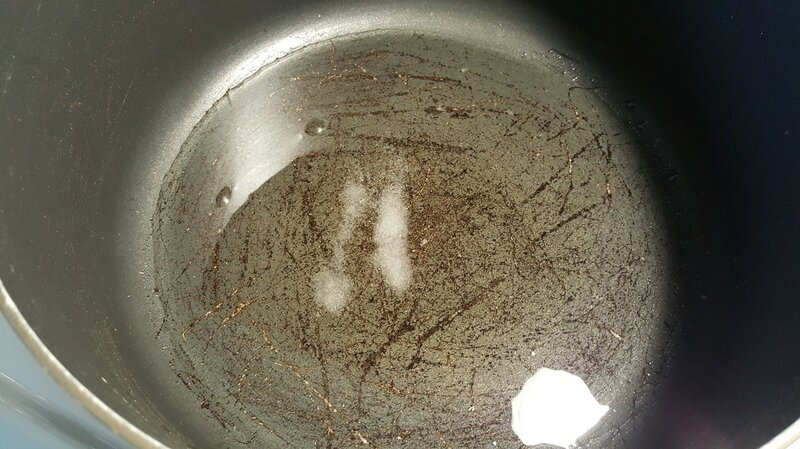 Depending on the size of your pot/pan, it can be anywhere between 2 – 4 cups. 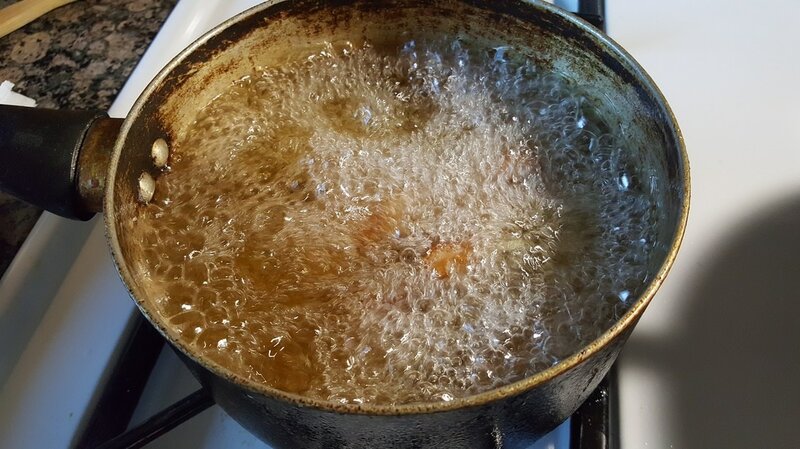 If the oil only submerges the chicken only halfway, then just be sure to turn the chicken during the frying process to crisp both sides. A deep fryer can also be used as another option. Turn the heat to high and wait until it reaches temperature. 9. Place the chicken in the hot oil in batches being sure not to overcrowd the pot/pan. 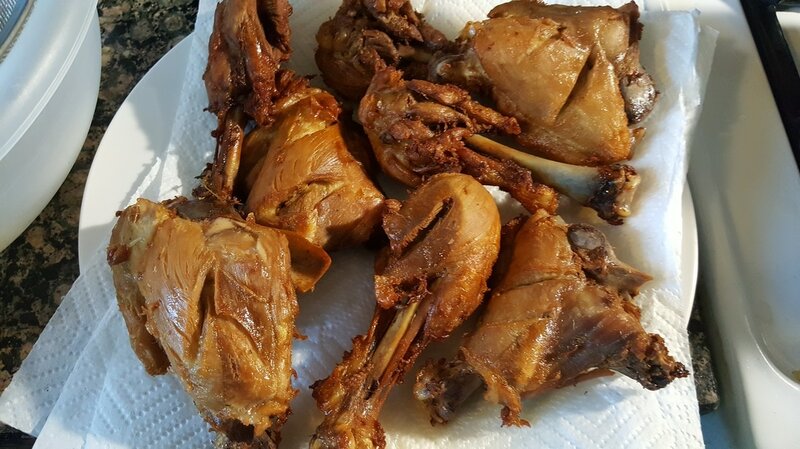 Fry the chicken for about 3 - 5 minutes or until the outside becomes a nice dark golden color. ​10. 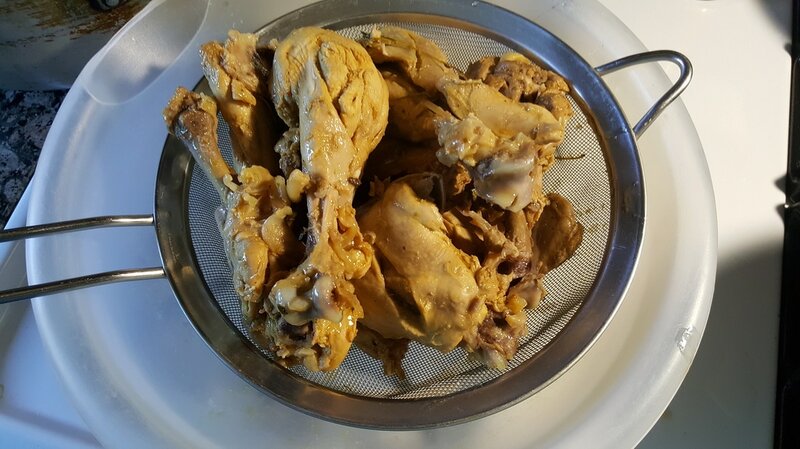 Remove chicken from hot oil and place on paper towel lined plate. Continue to fry remaining chicken until complete. What do you think of this recipe? What would you combine this fried chicken with?